He joined the RCAF in 1941, during a time when Britain stood alone against the Axis powers in Europe. He wanted whole heartedly to make a contribution, the stories his father had told him of the grim reality of the Great War ; the stories of rat filled trenches, the mud, the conditions of living in the trenches with shells bursting all-round the men. Only gave him brief hesitation on getting in and making that contribution. His choice was the Air Force. He had no illusions of what lay ahead and that it could be a short life being with the aircrew. He felt that the end could be quick but in the mean time you had a clean bed to sleep in. As most twenty-one year olds, he felt he did not fully know the reasoning that drives you to your decisions. But he was sure his decision was right. At Intital Training School he completed the physical exams for air crew. His poor night vision and problems with flying the light trainer took him to the Navigation trade school. Here his math skills and navigation abilities gave him the marks needed to graduate as a commissioned officer. As P/O Harris he mentions crewing up "with six of the nicest lads you'd ever want to meet" . The crews captain was an Australian pilot. He trained for operations and began in July 1943. For next six weeks they flew mostly over Germany; Berlin, and Hamburg along with others. He mentions "we wondered when our turn was going to come " and on the night of September 5th 1943 over Mannheim his Halifax was hit, everything started to shake. Before he could get his parachute on the aircraft was completely out of control "and I thought it was the end of the road for me "
He saw the stars above his head and knew he had somehow got out of the Halifax. He did not remember how, just pulling the rip cord and shortly after that hitting the ground. 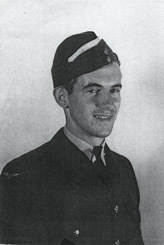 John Harris was the only survivor of the crew. After being picked up by the Germans he spend time in POW camps, most of it in Stalag Luft III. Where he did duty as one of the many watch dogs, keeping an eye on the German guards who patrolled inside of the camp looking for any escape efforts. For his efforts he drew number 179 for escape through the tunnel that was part of the Great Escape. That number was never called as the escape became know to the guards and those prisoners lined up and waiting to go out where stopped by the camp guards. He was over a hundred places away from being one of the escaper. He goes on to tell of the gloomy and dismal life as a POW. Then of the Long March, in January of 1945 as the POWs were marched away from liberation by the Red Army. The forced march took him over one hundred miles over several day one of the lucky ones to survive. He arrived with the other prisoners at Spremberg where a train took them to Bremen. After ten weeks the British Army came up from Holland and he was again on the road. Forced to march to Hamburg they wound up at Lubeck where on the 2nd of May they were liberated by the advancing Allied troops. 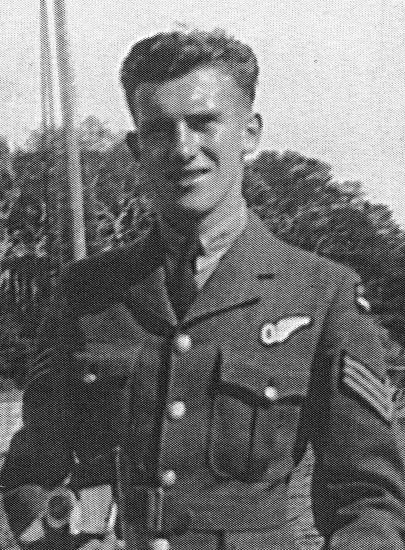 He and many others were flown back by the Canadian Army, but he may have also meant the RCAF who flew the liberated prisoners home on Lancasters and other large aircraft.